War was looming in this country in the early 1940s and Europe was in dire straits. Because of the strict gasoline rationing, my mother, sister and I moved from the country to an apartment building in White Plains, NY within walking distance of the railroad station. I was commuting to attend business school and my sister to her job at New York Life Insurance. While living in the apartment, I volunteered as an Air Raid Warden there at night, making sure that all blinds were closed and no light was visible on the outside. As new residents we could not get a telephone until the war ended. After graduating from business school, I was hired as a secretary in a bank in White Plains. There I met George, a wonderful young man, and we became engaged. George joined the US Army Air Force rather than waiting to be drafted and became a bomber pilot. George was sent to the Pacific area. I left the bank and applied for overseas duty at the Red Cross headquarters. I thought that I could request assignment to the Pacific area so that I could be near George. I was told that I was too young, but was offered a secretarial position at headquarters instead. Several months later George’s parents received the dreaded telegram: “Killed in Action”. Eventually I went to the Marine recruiting office to enlist but was turned down because they had reached their quota. 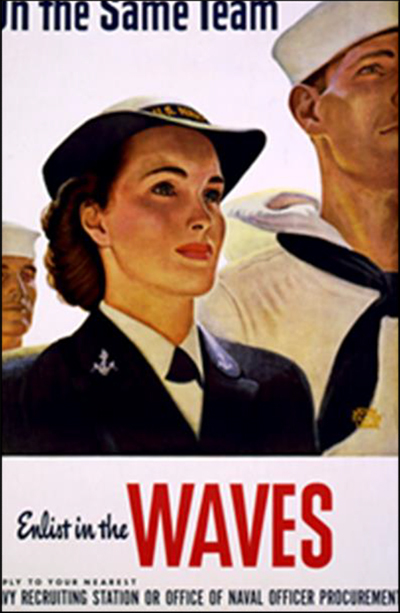 I then went to the Navy and was accepted immediately into the WAVES (Women Accepted for Voluntary Emergency Services). A few weeks later I was told to report to the Fordham Armory in the Bronx, NY. From there, a group of us were marched across the street to Hunter College for a head-to-toe examination including a mental exam. We were then sworn in for the duration of the war and outfitted with uniforms, including lisle stockings. Our basic training consisted largely of marching and saluting. I was given three choices for assignment, and I chose air traffic controller. I was given the title of yeoman; that is, an enlisted service member assigned to clerical duty. We were housed in an apartment building close to Hunter College – four to a room with bunk beds, and we ate at the Hunter cafeteria. During this time we were honored with a visit by President Roosevelt in his open-air limousine as we stood at attention. Weeks later I was sent on a long train ride to Oklahoma A&M to prepare for office work and to learn more about the Navy and the war. We were given daily briefings on the Allies’ progress in both the European and Pacific theaters. Two months went by and I was on another train ride to Quonset Point, RI for my assignment. I joined 10 other WAVES, each with a different specialty, assigned to the Anti-Submarine Development Squadron housed in a huge quonset hut. 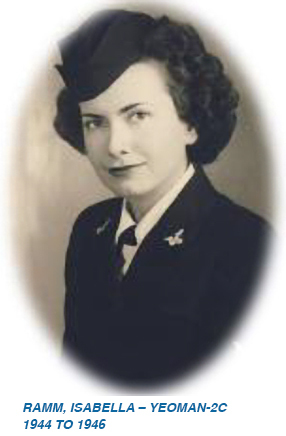 I had the feeling that the squadron felt compelled to accept us to replace men for active duty. I was assigned to the Commander, a southerner, a big man recovering from battle wounds. His face was badly scarred. He wasn’t comfortable having women in his squadron so he watched over us constantly. Quonset Point was a new base. We had a comfortable dormitory, four to a room and we ate at the base mess hall. We used metal trays with sections, sliding the trays along the serving area. The servers often missed the proper section. We had no choice of food. As the squadron was involved in the development of sonar, the building was well guarded and all correspondence was marked “confidential”. We also had a British officer assigned to our office. On one occasion I accompanied the Commander to a naval conference in Florida, and I stayed in a Coast Guard women’s barracks. Whenever we could, we flew with the pilots on their practice flights around Block Island while testing the sonar equipment. The USO would occasionally put on great entertainment for us, including Bob Hope and his troupe. As the war wound down, our squadron was transferred to Opa Locka, FL. I was given the choice of being discharged or sent to Key West. I chose discharge, but first went shopping in Miami for civilian clothes. After two years wearing a uniform, I selected two of the brightest, frilliest dresses I could find – and never wore! I was given $100 severance pay and a train ticket home. While in service, my monthly pay amounted to $50. Adjustment to civilian life was not easy. So much had changed. Many homes displayed gold stars in their windows, and so many men returned with serious injuries both physical and mental. I am sure that many suffered from post-traumatic stress disorder although that terminology was not used then. I was pleased to meet a fellow WAVE here at Pine Run, Mabel Billings. We enjoy reminiscing. Another WAVE, Margaret Lawrence, recently deceased, lived at Lakeview.